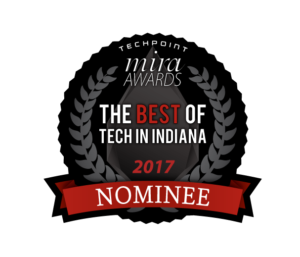 Nominees for TechPoint’s 18th annual Mira Awards were recently revealed, with half of the 180 applications received advancing in this year’s competition. The Miras honor the “Best of Tech” throughout Indiana and many of the nominees — as one might well imagine — have Indiana University ties. One such company, nominated for Innovation of the Year, was Arrythmotech, whose co-founders are Dr. Peng-Sheng Chen and Shein-Fong Lin of the IU School of Medicine. Launched with the help of the Indiana University Research and Technology Corp.’s Spin Up program, the company is developing a device capable of detecting, on the skin, the nerve activity that is responsible for the body’s fight-or-flight response. Its platform technology could potentially be widely used in the medical field. Also nominated for Innovation of the Year was IndyVitals by The Polis Center at Indiana University-Purdue University Indianapolis. A new digital monitoring tool for Marion County, IndyVitals is powered by SAVI, an interactive database created and managed by The Polis Center within IU’s School of Liberal Arts in partnership with The United Way of Central Indiana. Nominated as Tech Educator of the Year was the Informatics Diversity-Enhanced Workforce (iDEW) at IU’s School of Informatics and Computing at IUPUI. IDEW is a workforce development initiative with the IU School of Informatics and Computing at IUPUI in collaboration with communities throughout Indiana — plus IU business partners and high schools. A full list of Mira nominees is available here. Winners of the Mira Awards will be announced at a black-tie ceremony set for Saturday, April 29, at The Westin Indianapolis.